Founded in 1925, the Department of East Asian Studies in Göttingen is one of the oldest and most prestigious institutes for Chinese Studies in Germany. In 2008, the department was reorganized with a focus on Modern China. Researchat the Department focuses on transformation processes in Modern China. Research fields include Chinese history, philosophy, religion, politics, law, society, economy of Modern China as well as didactics of the Chinese Language. 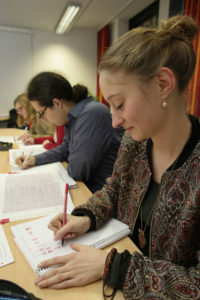 The BA and MA programs of the Department for East Asian Studies in Göttingen offer degrees from a well known university. The Georg-August-University and its various institutions regularly receive the highest university rankings at both the national and international level. The BA/MA in Modern Sinology offers an advanced education in modern Chinese (Mandarin) and a basic education in classical Chinese. The students of that program will acquire many analytical tools and methodologies from the social sciences and humanities. Due to an intensive training in Chinese history, philosophy, religion, politics, society, economy and law, they will also gain expertise in these research fields and can decide wich area they want to specialize in. BA/M.Ed. Chinese as a Foreign Language provides an advanced education in Modern Chinese (Mandarin), a basic education on modern China and teaching skills as well as didactics to prepare the students to get their teacher’s degree at the end of the Master program. The BA Modern China consists of a basic education in Modern Chinese and offers its students training in Chinese history, philosophy, religion, politics, society, economy and law. Additional non-China related modules can be chosen form the University catalogue.